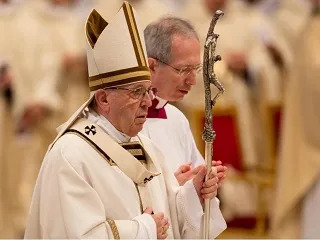 Vatican City, Oct 21, 2018 / 05:24 am (CNA/EWTN News).- The throne of Jesus Christ is the cross upon which he gave his life for the world, and those who wish to follow him must be prepared to sacrifice everything, Pope Francis said Sunday. “The message of the Teacher is clear: while the great of the earth build themselves ‘thrones’ for their own power, God chooses an uncomfortable throne, the cross, from which he reigns giving his life,” the pope said Oct. 21. In his mediation before the Angelus, Pope Francis reflected on the day’s Gospel, in which James and John ask Jesus to grant that they may sit one on his left and one on his right in the Kingdom of God. After the Angelus, Pope Francis led those present in St. Peter’s Square in praying a ‘Hail Mary’ for those who have given their lives for the faith. He also praised the witness of Bl. Tiburcio Arnáiz Muñoz, a Jesuit priest and founder of the Missionaries of the Rural Parishes, who was beatified in Malaga, Spain Oct. 20. He concluded by greeting the participants of a Rome pilgrimage which took place earlier the same day, which was led by Caritas International and Cardinal Tagle. The pilgrimage was part of an initiative called, “Share the Journey,” which promotes fraternity between immigrants and non-immigrants. Vatican City, Nov 11, 2017 / 11:16 am (CNA/EWTN News).- The future of the Church and the world is dependent on the good of the family, said Pope Francis in a video message Saturday.